warm greetings from Jaggery Camp ~ Singer Mali here. We will be presenting a concert at the Museum of Fine Arts, Boston on Friday, May 1st, featuring new material inspired by the life and work of Leonardo da Vinci. We’re calling the show Jaggery Presents The Beautiful & The Grotesque and it coincides with a visiting exhibit at the MFA of rare Leonardo drawings, some of which have never been shown before in Boston (Leonardo and The Idea of Beauty). This is a “big-deal” show for us — I’d say the biggest deal show we’ve ever had, and it’s been in the works for months. We’ve been immersing ourselves in everything da Vinci ~ the fella was pretty much a genius, and it’s more than a little daunting, to say the least. That being said, we’ve jumped in neck-deep ~ almost every member of Jaggery will be creating their own piece for this one, we’re planning some never-before collaborations, and in general, THE SHOW IS GONNA ROCK LIKE . . . LIKE . . . like . . . well, I can’t think of a suitable Leo reference that would work well here, but heck, just look at the poster! We are particularly honored to have the spectacular Rabbit Rabbit (Carla Kihlstedt/Matthias Bossi) start off the night, with special guests joining them, including bass wizard Jon Evans, who we’ve had the privilege of working with as engineer and co-producer on the new album! We REALLY REALLY hope you can make this one! We can’t wait to share the new songs (well, actually, at this stage we really can wait as they need rehearsing & some still need to be written) as well as the process of seeking inspiration from the remnants, the clues, the artifacts of the process of this very ambitious, revered, brilliant, remarkable artist/inventor/scientist and true Renaissance man. Come party with us like it’s the fourteenth to seventeenth century!!! 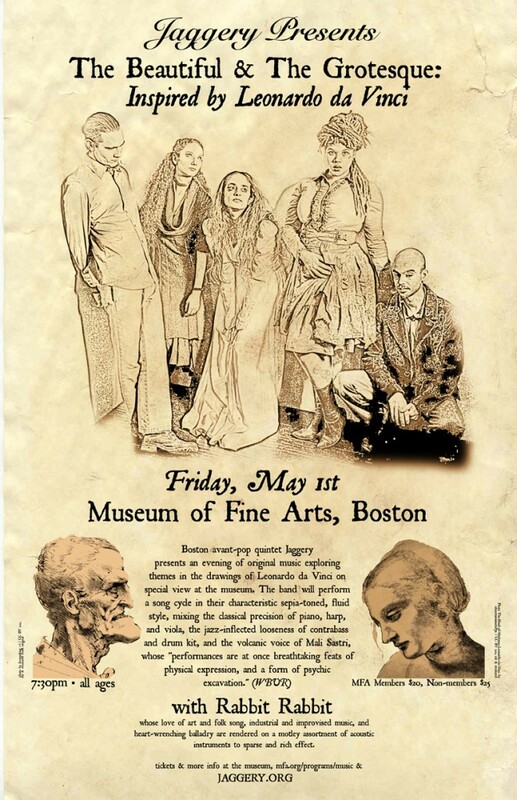 Notes: Jaggery Presents: The Beautiful & The Grotesque ~ Inspired by Leonardo Da Vinci Boston-based avant-pop quintet Jaggery presents an evening of original music exploring themes in the drawings of Leonardo da Vinci. The band will perform a song cycle in their characteristic sepia-toned, fluid style, mixing the classical precision of piano, harp, and viola, the jazz-inflected looseness of contrabass and drum kit, and the volcanic voice of Mali Sastri, whose “performances are at once breathtaking feats of physical expression, and a form of psychic excavation.”(The ARTery) Sonically conveying the themes of beauty in da Vinci’s work, the group will push opposites–light and shadow, delicacy and ferocity–producing a palette of gnarled elegance and graceful clashes. With opener Rabbit Rabbit, whose love of art and folk song, industrial and improvised music, and heart-wrenching balladry are rendered on a motley assortment of acoustic instruments to sparse and rich effect. Ticket Required Tickets Available 1/15/2015 10:00am To order tickets by phone, call 1-800-440-6975; to order in person, visit any MFA ticket desk. For $5 more, enjoy guaranteed Premium Seating in the first three rows of the auditorium.